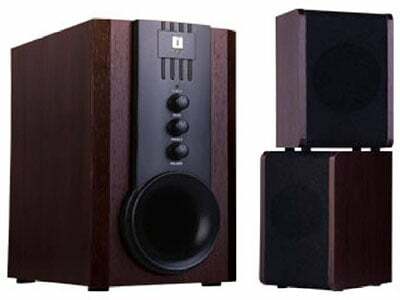 Are you looking for Best 2.1 Speakers under 3000 Rupees in India? Don’t worry we are here to help you to there are tons of options available in the market, for now, a good Home theater system under Rs.3000. Some speakers come from big brands like Philips, F&D, Creative or iBall and some from really new brands like Obage. But we are not here to share brand names with you guys. We tested almost all the speakers in this price range from these brands and below we listed according to our choice. You can also go to local market and judge by yourself which sounds best but few really good speakers only available online so it’s hard for a normal consumer to know which of these speakers offer the best value for there money. Almost every person who owns a PC definitely has a 2.1 Speakers with their Computer. If you want a good sound system for your home or office. We listed some high-quality 2.1 speakers that will offer you amazing volume and clarity you need under this really tight budget. But in case your budget is lower then 3K then you can also check out our list of Best 2.1 Speakers under Rs. 2000. 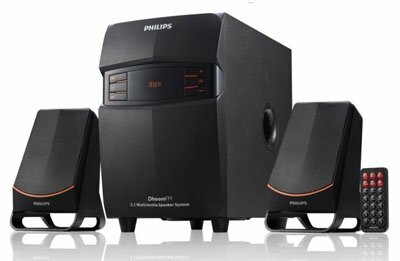 Philips make some great speakers in different price segments and Philips MMS-2550F/94 is the Best 2.1 Speakers under 3000. The housing of the subwoofer is made from wood, giving it superior stability and acoustical performance. A chamber behind the speaker driver that channels air to acoustically tuned vents built into the speaker gives the bass notes a more punchy, realistic sound. Speakers look really nice as well as sounds great with deep bass overall these 2.1 speakers never let you down if you are looking for a good home theater system for your home. This provides 2500W PMPO Output. It Supports USB and SD Card only MP3 format can be played. FM Support is also there. 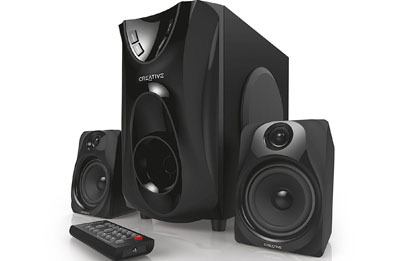 Take your entertainment quotient to another level with the Creative E2400 Home Theatre System. These speakers are multipurpose and can be used to connect to almost every audio device. The home theatre system comes with 2 speakers and one sub-woofer. 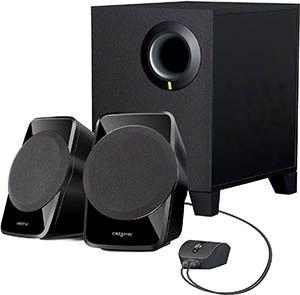 A well-balanced home entertainment speaker system, it produces a raw audio power of about 25 watts. 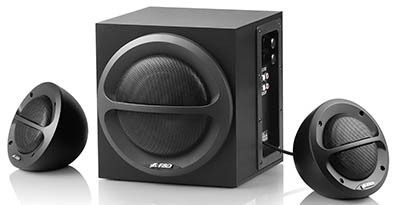 The subwoofer is wooden which is ideal for producing bass reproduction. There is a wireless remote control so that you can easily monitor the volumes and equalizer. There is also an RCA and 3.5 mm input which helps you to connect to other external devices like laptops, tablets, and media players. This dual connectivity helps to enjoy your music, movies or games, irrespective of the device you want to access. The entertainment system is an ideal fit for your living room as it evenly distributes sound to all corners. You can now have a theatre like an experience with this high-quality Creative home theatre system. These High-Performance speakers that produce 25W of raw audio power. Wooden subwoofer cabinet for excellent bass reproduction. A built-in MP3 player that plays music from your USB thumb drives. F&D A140X offer great sound experience with 3-inch full range drivers. Stainless steel grill protects the satellite drivers from rust or corrosion. Colorful LED lighting can make the mood for any soundtrack. With a 3″ full range driver for satellites and a 4″ bass driver for the subwoofer, you can experience full, clear sound with a powerful bass. Compatible with Bluetooth 4.0, Plug & Play USB card reader, FM stations, and more for interrupted listening around the clock. 2.5-inch full range driver for satellites and 4-inch bass driver for a subwoofer. Bluetooth 4.0 version audio streaming. Plug and play USB card reader. USB reader supporting MP3/WMA dual formats decoding. FM storage for up to 100 stations. It has lots of connectivity options like Bluetooth FM, USB, AUX, SD Card Support. Good Bass Output with crystal clear sound. If you are looking for speakers that deliver crystal clear sound quality then F&D A510 2.1 Multimedia Speaker is a great option for you. 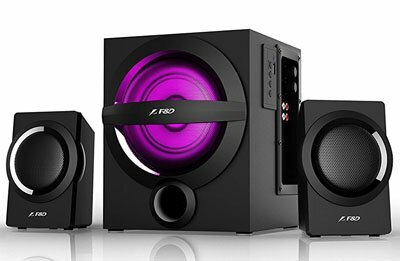 F&D is a well-known brand in India for speakers they build amazing speakers in the budget range. Control what you want to listen to You can connect your TV, CD/DVD player, PC, Mobile, MP3 player and listen to your favorite music with superior quality. Its connectivity with so many devices makes it a one-stop destination for all the music lovers. It has 4″ full range driver for satellites speaker, 4″ inch bass driver for a subwoofer. Heavy-duty metal grill for satellite. Built in AVR (Automatic Voltage Regulator) for wide main operating voltage range. Side panel controls for volume and bass. Green LED power on indicator. Wooden cabinet delivers strong and low distortion bass. The Creative SBS A-120 2.1 Multimedia Speaker System is an ideal companion for listening to quality audio as it offers better sound throw and is armed with enhanced sound producing technology.The music system includes two satellite speakers and one sub-woofer. The sub-woofer has an output capacity of 4 W while the satellite speakers offer an output of 2.5 W. Thus, you receive powerful sound with better sharpness. These 2.1 configuration speakers generate an audio output of 9 W. With a frequency of 50 to 20,000 Hz, you can listen to all minute sound details with the utmost clarity. All these features come loaded in a compact body which comes in a sleek design. So, Overall that is also a good choice under Rs. 1669/- in India. 1 Year Limited Hardware Warranty from the date of purchase. iBall Tarang 2.1 Speakers are good option for your home party with the powerful sound output of this 2.1 multimedia system. This multimedia system supports 68 dB signal-to-noise ratio and also has a total output of 40 W RMS, which ensure that you get distortion-free audio even at high volume. The satellite speakers in this set come with magnetically shielded wooden chassis which prevents unnecessary interference from other electronic devices and help the system deliver exceptional sound irrespective of where the speakers are kept. Total Power Output is 40 W RMS. Frequency Response: 20 to 200 Hz (Subwoofer). 100 to 20000 Hz (satellite). So, that is Our list if Top 5 Trusted Speakers which we test and use and all are best choices you can make under Rs. 2000. If you have wanted any help feel free to ask in the comment section below. If you like this article then please share this with your friends and family.